Peace News Summer Camp has been running since 2009. It is taking a break in 2018. Usually, it is a gathering of people from across the broad spectrum of the British peace movement for five days of exploration, celebration and empowerment. We pool our contributions to a hothouse of creativity, a small self-governed society run by democratic camp meetings, a viable example of the kind of world we are trying to bring about. Peace News Summer Camp helps build a radical movement for the future by building a living community today. We learn from other movements, struggle with challenging issues, create more cohesion in a segmented peace movement and debating nonviolence. Workshops range from theoretical discussion (an introduction to Chomsky’s Politics) to practical planning for actions later in the year. Fifty years of activist experience are usually represented, along with fresh faces and new blood. Fed by local organic fruit and veg (lovingly cooked by the wonderful Veggies of Nottingham), we try to camp in a family-friendly and renewably-powered way, to make the world a better place. A whole-camp participatory workshop giving us an opportunity to explore different kinds of oppressions which have an impact on us, especially classism, and to consider creative responses to those oppressions in our groups and in our lives. ‘Collective Liberation’ means pursuing liberation for us all. Run by Peace News staff. On 13 April 2016, less than three months after the launch of Fossil Free Hastings, Conservative and Labour councillors in Hastings united to unanimously pass a fossil fuel divestment motion, and to call on East Sussex county council to rid itself of £172m in oil, coal and gas investments. This workshop is a chance for campaigners from different areas to share their experiences, insights and strategies. Gabriel Carlyle co-ordinates Fossil Free Hastings. We all want our meetings to go well, but often they don’t. This workshop is for people who have done some facilitating and would like to get a bit better at it. For folk who would like the meetings they run to be enjoyably effective rather than endlessly endured. Facilitated by Milan Rai of Peace News. The film will be announced at Camp! We might re-screen A Life Well Loved, which chronicles the life of Felice Yeskel, co-founder of US anti-classism group, Class Action, from her early feminist roots to her LGBT activism to the Women’s Pentagon Action to Felice taking on classism in the US. Learn a little bit about wood engraving from one of Britain’s leading political printmakers, Emily Johns. Emily Johns exhibited as part of the Society of Wood Engravers’ 79th annual exhibition last winter. In the last 12 months, the world has changed dramatically as a result of Donald Trump being elected and the United Kingdom voting to leave the European Union. Liz Fekete will talk about how these shifts have affected marginalised communities in the UK. Liz Fekete is the director of the Institute of Race Relations. Bek is a finance officer! The Follonsby Miners Lodge Banner shows us social democracy, syndicalism and Bolshevism, the ballot box and the bullet, parliament and the general strike. Originally made for The Follonsby Lodge in Wardley, Gateshead, the banner featured Labour Party radical Keir Hardie, Irish revolutionary James Connolly, and communist leader Lenin, as well as 1920s miners’ leader AJ Cook. The banner was recently recommissioned by ex-Wardley Colliery miner Dave Douglass. Dave Douglass is a member of Class War, NUM, IWW. Come and learn the basics. What is Direct Action? Why do we do it? And how do we do it? All will be done in a fun and participatory way. Ali Tamlit and Helen Brewer are from Resist and Renew, a collective of artists, activists and radical educators who facilitate workshops, courses and events. What does ‘nonviolent revolution’ mean? How could we possibly make one happen? This is an opportunity to explore together what might be involved in transforming society, referring to Howard Clark’s Making Nonviolent Revolution and George Lakey’s Toward a Living Revolution (both published by Peace News). Milan Rai is editor of Peace News, whose tagline is ‘for nonviolent revolution’. Activists are increasingly having a difficult time keeping track of the challenges they face. This workshop will explore techniques that provide them with essential self-care, to recharge their batteries and increase their capacity to face challenges. Karen Larbi works at Time to Change, a growing movement of people changing the way we all think about mental health problems. In a 22-minute conversation you can see on YouTube (search for ‘deep canvassing’), Steve, a young white gay US man, completely wins over an African-American woman who initially says that she is not prejudiced against trans people, but… Using curiosity and respect, Steve listens, empathises and shares. The Los Angeles LGBT Centre have invented something new and effective in reducing prejudice, with results verified in a peer-reviewed article in Science. Milan Rai has been on the Hope not Hate ‘Difficult Conversations’ training based on Deep Canvassing. A chance to draw alongside, and to learn from, one of Britain’s leading radical artists, Emily Johns. Emily’s work is currently part of ‘The Sussex Open’ at the Towner Art Gallery, Eastbourne. Emily Johns is the PN layout and production worker. Betsy Leondar-Wright, one of the co-founders of Class Action in the US, has written two books about class and classism: Class Matters: Cross-Class Alliance Building for Middle-Class Activists and Missing Class: Strengthening Social Movement Groups by Seeing Class Cultures. She has facilitated over 100 class and classism workshops since the 1980s. Unfortunately, Betsy can’t be with us at Camp, partly because of a family health emergency, partly because the main training she was coming for has had to be postponed till next year. But she will be with us by Skype! Class and class inequality have become bigger and bigger topics in the last few years, with the financial crisis, austerity, the class divide over Brexit, Trump’s claim to represent the US ‘rust belt’, and, most recently, the Grenfell Tower tragedy. This is a chance to explore what effect class and classism is having on us and on our campaigns. 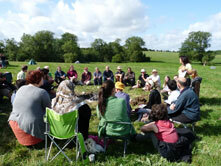 Kathryn Tulip is from a working-class family and she is a trainer with Navigate in Oxford. Milan Rai is from a middle-class family and he is a trainer with Peace News in Hastings. Penny Stone will teach some harmony songs from international movements for social change. There will also be the opportunity to participate in some facilitated group songwriting on current issues that people are concerned about. Penny Stone is a songleader, community musician, songwriter, singer and activist. She teaches music and song from all over the world as well as using songwriting to help enable people to find their own voices and voice their own experiences. End Deportations successfully stopped a mass deportation charter flight in March. In this participatory workshop, we will explore the context of the UK border regime and the hostile environment and discuss different ways to get involved in the campaign to end deportations. Eddy is part of Plane Stupid. Ben is a member of Lesbians and Gays Support the Migrants. There has been a surge of political activism since the election of Donald Trump as US president, as people fear for the planet and for our societies. How should we, as campaigners in grassroots movements for peace, justice and a stable climate, react to this new unpredictable era? A facilitated discussion with a guest speaker. Bruce Kent is a vice president of CND and Pax Christi. If you’re tired of talking, but not tired of eating, come bake cakes for everyone! Veggies are three-times winners of the Vegan Society’s ‘Best Vegan Caterer’ Award. Activists are increasingly having a difficult time keeping track of the challenges they face. This workshop will help participants identify unsustainable practices in their life, environment, and relationships that give rise to burnout. There will also be an exploration of techniques that provide them with essential self-care, recharge their batteries and increase their capacity to face challenges. Peter Tatchell has been a prominent LGBT and human rights campaigner since the 1960s. He has been involved in 3,000 direct action protests, arrested over 200 times and subjected to 300 violent assaults. From his vast experience of campaigning on a host of issues, Peter will talk about the key ingredients needed to ensure that your campaign is successful. The abolition of war is desirable, possible and essential. Disputes can be resolved through dialogue without creating the cycle of murder and revenge. Bruce Kent is also vice president of the Movement for the Abolition of War. Robb Johnson, the brilliant radical folk singer-songwriter, is coming back to Summer Camp. His latest album is My Best Regards. Tracey Curtis, another wonderful political folk singer-songwriter is also coming back to play for us at Camp. Her latest album is Thoughts in the Dark. Robb and Tracey have a connection. Once part of pop punk band ‘Shelley’s Children’, Tracey was encouraged by her children to write a protest song against a planned by-pass that would ruin their local riverside dens and rope swings. She went in to the studio to record ‘Nowhere Left to Play’, planning to send it out to local radio and TV stations. With that song recorded in three minutes, and a whole hour’s studio time booked, she just carried on playing, and recorded all the other songs she had written at the time. This became ‘The By-pass Demo’. Robb Johnson heard the demo and within a few months ‘If the Moon Could Talk’ was recorded for UNLABELLED, a co-operative off-shoot of Robb’s IRREGULAR RECORDS. This workshop explores how Mindfulness and Inquiry-based practices can support activists by: preventing burnout; developing self-care strategies; building emotional resilience; connecting us with with our hearts and each other. Staying calm and centred preserves energy, maintains focus, and allows us to keep in close contact with our creativity and inner resources. The workshop offers a tool kit of practices helping us to keep on engaging with what matters. Colette Power is a senior mindfulness teacher, trainer, and supervisor with Breathworks CIC. In the week running up to the huge DSEI arms fair in London in September there will be direct action to try to stop it happening at all. Weapons sold at DSEI fuel death, destruction and injustice all around the world. In 2015, hundreds of people blocked entrances for six days, disrupting the set-up of the fair. This year, we plan to shut it down for good! Joanna Blackman is an activist and a trainer with Turning the Tide. This is a guided walk to the Burston Strike School just a mile from Camp. The Burston school strike began in 1914 when teachers Annie and Tom Higdon were sacked from the village’s Church of England school for standing up for local working-class people. The schoolchildren – led by Violet Potter – went on strike, and the community founded the strike school. The school strike lasted from 1914 to 1939! Shaun Jeffery is a landworker and secretary of the Burston Strike School trustees. Lunchtime meeting: What next for Peace News Summer Camp? This is the ninth Peace News Summer Camp. What should we do with it next? What energy and ideas would you like to put into future camps? This is a drop-in session, generating some ideas for the conversation which is part of the Monday morning workshop. With members of the Summer Camp organising group. How is Brexit going to affect migrants and how is immigration law going to change? Find out how the referendum result last year might affect those that are escaping tyranny in the hope of solace in the UK. Adrian Berry is a barrister, specialist in British nationality, statelessness, EU free movement, immigration, asylum and social welfare law. Intrigued by Noam Chomsky and want to know more? According to Chomsky’s Propaganda Model, the mainstream media and academia in the US and UK are free from state control, but at the same time function as if they were part of a state propaganda machine. How does ‘brainwashing under freedom’ come about – and what can we do about it? Milan Rai is the author of Chomsky’s Politics (Verso, 1993) and contributed to the Cambridge Companion to Chomsky (Cambridge University Press, 2005). Learn the techniques that make make up an Indian Head Massage to help friends and family feel relaxed. Rakesh is a trained therapist. For new folk: an introduction to Peace News, the organisation that gave birth to Peace News Summer Camp, and whose values inspire the camp. For existing readers: a chance to tell staff what Peace News should be doing. For campaigners: how is PN useful? How could PN be more useful to your work? With some PN staff members. Everyone brings out their talents to share with the camp! Starts with children’s performance and then goes through every possible type of entertainment. Please bring a musical instrument. This is a space to reflect on all that has happened during this camp and what we’ve learned, and to be thoughtful about what we want to do in the year ahead, individually and collectively. There will also be a chance to influence decisions about the future of Peace News Summer Camp.